This edition brings you some very interesting articles and some new features. Don’t miss “My Boston & Albany – Learning to Compromise” by Chuck Oraftik, Roger Murphy’s “The Weehawken Waterfront”, “Creating a NYC&HRR 4-4-0” by Chuck Baldwin, “Responding to the Challenge” by Joe Rothwell and “Modeling a P&LE Evans Coil Gondola” by Tom Stelby. Manuel Duran-Duran and Larry Faulkner continues to update us on the progress on their Harmon Coal Chute in their regular features, “The NYC Engineering Department” and “Harmon Files”. David Howarth continues with Part Three of his “NYC West Shore” showing us many of his outstanding O-scale locomotives and rolling stock. 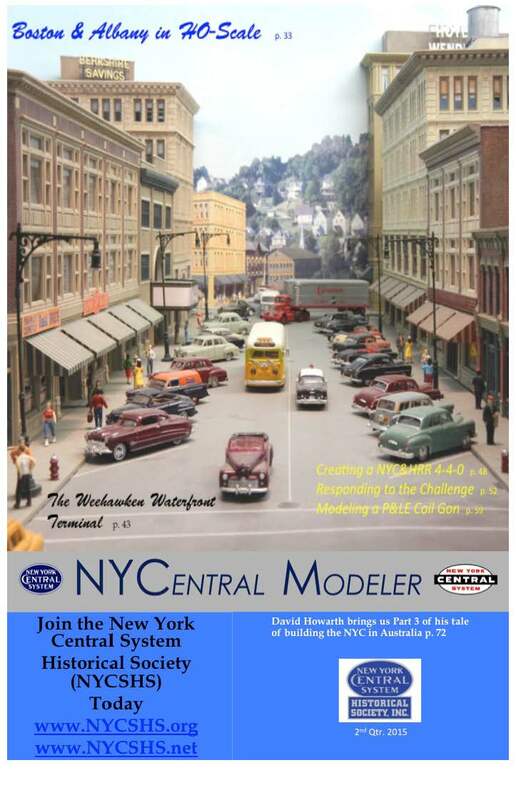 Be sure to tell all of our model railroading friends to join you to download the NYCentral Modeler or just enjoy reading it on your screen. This entry was posted in Members Information, NYCentral Modeler, NYCSHS Models, NYCSHS News. Bookmark the permalink.